Big Basin State Park is home to the largest continuous stand of ancient coast redwoods south of San Francisco in the Santa Cruz Mountains. There are many trees over 1,000 years old. 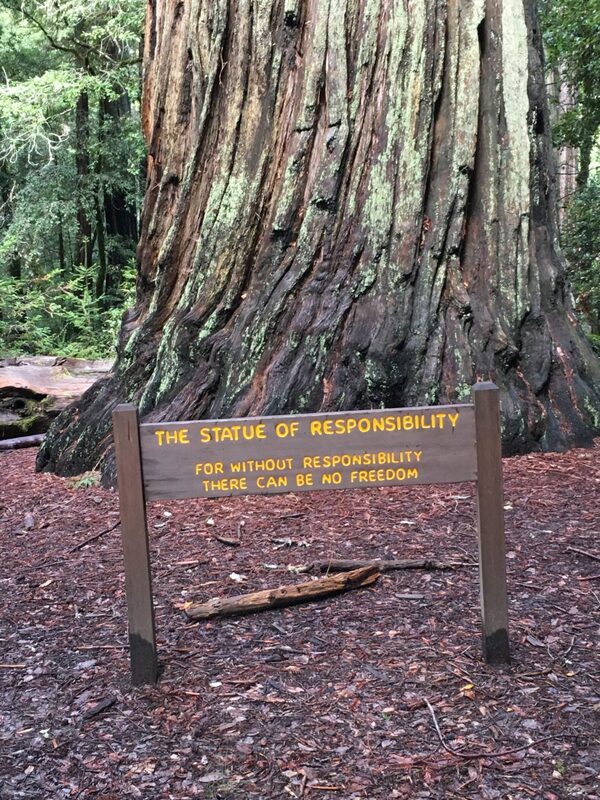 Next to the visitor center you notice the “Tree of Responsibility”; a reminder of the many people who have worked tirelessly to protect redwoods since 1901. The responsibility tree and it’s noble champions reminds me of people with the Gallup Strength of Responsibility. People with responsibility are filled with dedication and commitment. And, at times, it is a strength that needs a volume adjustment. We all know the people with responsibility strength. They are hard wired with the values of loyalty and honor.When people with the responsibility strength say, “yes, I’ll get that done”, you can count on them. Their dedication to people, process, deadlines, and projects brings them great success in organizations. They are energized by the completion of tasks and stay true to their word of “you can count on me”. However, this is one of those strengths that the “volume” sometimes needs to be monitored by: individuals with the strength, fellow team members and managers. If you are a person with responsibility, watch that this strength does not dominate all your other strengths. When the volume of your responsibility strength is on too high you may have said yes to too much.You may end up having to work exceptionally long hours to meet all the commitments. If you have responsibility as a strength, you may want to check yourself on how you are doing at balancing your commitments to work, family, self care, friends, and community. Lower the responsibility volume a bit and see what other strengths you could turn to to energize you. For teams with colleagues with this strength, it’s important to monitor how much is allocated to the responsibility person’s plate. It’s easy for teams to turn to the responsibility strength member because they know the task will get done. Check that all members of the team are taking on new and urgent responsibilities. A team that learns how to leverage their collective strengths to get tasks completed creates a more sustainable model. Checking the volume on everyone’s strengths is a great way to balance the team. For managers, honest communication with individuals with responsibility is recommended. Remember, people with this strength are energized by the completion of tasks. As the manager you can work with him/her to make sure the energy is focused on the right tasks at the right time. Gratitude is important. In addition, managers need to make sure they don’t over “ask” these employees because they know the work will get done. Work together to set the right volume of this strength. Responsibility is an amazing strength. To all you responsibility people, thank you for all you do in a day for your team, your family, and your community. And, I invite you to check the volume now and then. Monitor how many things you say yes to and avoid burning out. We need you to be mighty and strong like a redwood for the long haul.